Anyone who has flown combat sorties in the last 40 yearsprobably knows all about the SA-2 "Guideline". This rather largesurface to air missile has been used by Soviet Bloc countries since themid-1960s. It was probably most successful over the skies of North Vietnam,mostly due to the number of sorties flown by Allied forces. In fact, so heavywas the use of the SA2 that the North Vietnamese actually ran out of missiles.Thanks to skillful diplomacy of North Vietnamese negotiators in Paris, the woolwas pulled over the eyes of the Americans and there was a bombing halt. Duringthis time the North Vietnamese were able to resupply, all without Americanforces realizing how perilously close they were to being able to attack targetsin the north with relative impunity. It only goes to show you that politics andwar do not mix!! The SA-2 V750VK anti-aircraft missile required ground trackingof the target and was not a 'fire and forget' type of missile. Once the missilegot close enough to the target, a proximity fuse exploded the warhead andshrapnel from the missile then spread all over the sky. Hopefully for thedefending forces, this shrapnel would damage the aircraft enough to bring itdown. Fortunately for the Americans, an SA-2 was captured intact bythe Israelis in the 1967 war with Egypt. This enabled countermeasures to bedeveloped. It was also a rather large missile, likened by pilots to a 'flyingtelephone pole'. As such it was possible to outmaneuver the missile and cause itto lose lock. SAM suppression aircraft (wild weasels) were also developed alongwith tactics for destroying the guidance sites for the missiles as well as themissiles themselves. Nonetheless, the SA-2 can lay claim to being the first trulysuccessful Surface to Air missile system. There are three Airfix molds that have been lost or damagedbeyond repair. A ship kit (I think it is the SS France), the James Bond AstonMartin DB.5 and the SAM-2 Missile. That makes this kit a very highly sought collector's item. Atone time I had four of them, but have sold three of them off. Each of thembrought over 10 times what I paid for them. So you can see, if you find one, itis a good idea to put the grabs on it as it will never be reissued. The kit itself is a child of the 60's/early 70's. It is verynicely molded in an odd buff plastic. The parts have very acceptable detailingwhich is either raised or engraved depending on what it is for. This and theother kits I had are flash free and for the most part, had ejector pin marks inhidden locations. As you probably know, this and other Airfix kits are in OO scaleor about 1/76 to fit in with train sets (why this is I haven't a clue). However,the scale difference isn't that much and they do look quite in place with 1/72items. The kit is rather complete and provides basically four majorassemblies. There is the missile itself, the truck, the trailer and thelaunching stand. Each of these is a small kit in and of itself, witnessed by thefact that there are 125 pieces to this kit, most of them less than large! Thereare no transparencies for the truck so you will have to make those out of clearacetate sheet or just leave them open. 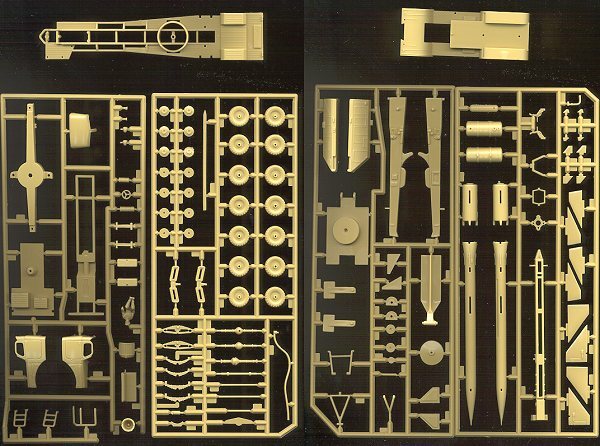 It is really surprising that Dragon or Tamiya have not producedthis kit in 1/35, though there are a number of rather pricey resin kitsavailable. Perhaps that will happen when they run out of other subjects to kit! If you would like yourproduct reviewed fairly and quickly by a site that has over 1,000 visits a day,please contact me or see other details inthe Note toContributors.